This page provides an overview of the 2015/16 AP student collection (C15054). This should be used alongside the C15054 coding manual, which provides more detailed, technical information about the collection. What is the AP student stream? The AP student stream collects data about students studying at alternative higher education providers. The sector uses this term to describe specialist providers of HE. Details of which students need to be returned to us are included in the Coverage document found in the Coding manual. The data we collect on behalf of the sector is provided to the government and the relevant funding council in order to support the regulation of higher education. We also make anonymised data available to the public to enhance understanding of UK higher education and to support its advancement. Where can I find further help with the AP Student record? Who are Liaison? Principle 1 of the Data Protection Act 1998 requires that information be provided, or made readily available, to data subjects so that they are not deceived or misled as to the purposes for which their data is to be processed. In order to satisfy this principle, the statutory bodies and HESA supply text for use by alternative providers. This text can be found on our website. You must make these notices available to all relevant data subjects. You should consult the Revision History page of the coding manual for a full technical list of changes to the C15054 record specifications. A significant amount of change has occurred since C14054 including schema changes, changes to the coverage and clarification to existing guidance. We issue regular communications during the life of a collection. For a summary of all communications associated with the 2015/16 AP Student collection please see the Notification Log. Access to the data collection system for the C15054 collection, as well as for Minerva, is governed through our Identity System (IDS). IDS serves as a single-sign-on portal governing access to all our websites. This means that you will have one username and password to access all of our services. The IDS system also allows you to grant and revoke additional roles relating to viewing and submitting data. The AP student record contact for each provider has access to the data collection system. The record contact is able to invite additional colleagues to have access to the system to submit data and view reports. Further information can be found in our IDS User Guide. For the C15054 AP student record, we have adopted a modular (tranche) approach to delivery of the data collection system. This means functional components of the system are being released incrementally during a period from March leading up to full functionality being available in early September. The Tranche initiative gives you more flexibility in when data can be submitted. This in turn provides a longer window for data quality checks to be made. For the C15054 collection, you need to submit a single file containing full data. Each subsequent file you upload will replace the previous one. If you prepare your data in multiple *.xml files, our XML amalgamator tool will combine these records prior to submission. HEFCE will generate two comparative outputs (the HEAPES re-creation and the Student Loans Company comparison). These compare the data you submit to us with data from other sources, with a view to improving data quality. HEFCE will write to you in early September with more information about these outputs. The HEAPES re-creation will be made available to providers from early September as part of the Information Reporting Interface Service (IRIS) reporting available through our data collection system. The SLC Comparison, which will also form part of the IRIS output, will be available from mid-October. You are required to review both of these outputs to ensure that the data returned to us is accurate. 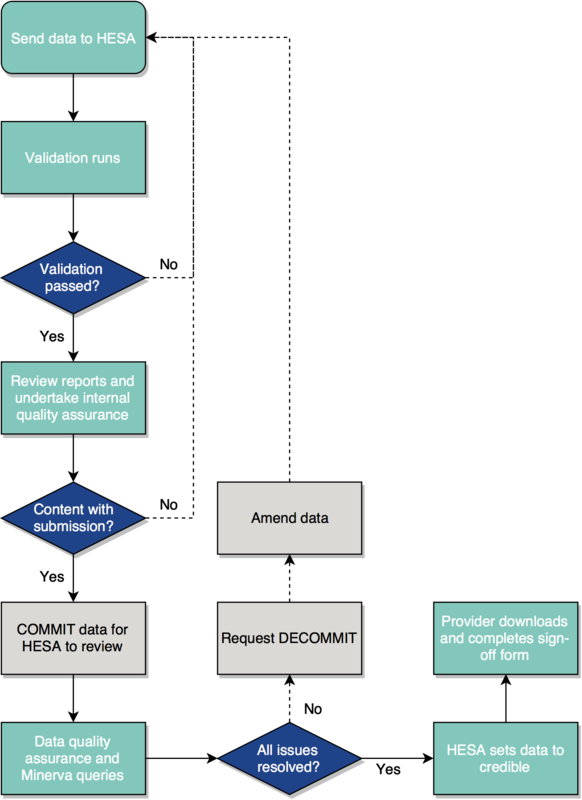 Our Validation kit grants you earlier access to the validation processes to test against schema and business stage quality rules. The 2015/16 AP student validation kit is available for download. During the data quality checking phase of data collection, 'committed' data will be reviewed by us and HEFCE. Resulting data quality queries will be raised with you through the Minerva system. We expect you to respond to all queries raised prior to sign-off by the head of your provider. Failure to do so may result in the sign-off not being accepted. As a guide we expect that these queries should be answered within 5 working days. Analysis and outputs provided by us use derived field groupings to produce populations. Full details of the derived fields that we use in analysis of the C15054 AP student data are available from the C15054 coding manual page. QR.C15054.Instance.COMDATE.5 is triggering correctly but is not displaying the Instance.COMDATE value reported in a previous collection. QR.C15054.StudentEquality.ETHNIC.3 is triggering correctly but is not displaying the StudentEquality.ETHNIC value reported in a previous collection. QR.C15054.Student.SSN.8 is triggering correctly however the column headers do not line up with the data. The value currently shown in the column labelled 'HUSID' is the Student.SSN value reported in a previous year, the Student.HUSID is displayed in the next column. QR.C15054.EntryProfile.QUALENT3.6 is triggering correctly however the column headers are incorrect. The column labelled 'NAMECAT' contains the EntryProfile.QUALENT3 value reported in a previous year. Tables SSN1 and SSN2 are unable to display for some providers. QualificationsOnEntry.QUALYEAR =2016 was not recognised as valid in schema. This has now been corrected in both the coding manual and validation. QR.C15054.QualificationsAwarded.QUAL.6 triggering incorrectly where a single qualification exists. QR.C15054.Instance.InstancePeriod.1 triggering incorrectly where only a single instance period exists. QR.C15054.Instance.COMDATE.6 is triggering incorrectly for students where the COMDATE is before the 1st of August 2015. The NSS report - this is the National Student Survey population and includes the list of students that are eligible to be surveyed from February 2017 and also details the students who are not eligible. Providers are encouraged to review the reports to ensure that the population is as expected. Additional Continuity stage warnings - these are only applicable to those providers who submitted data in the 2014/15 record and highlight cases where data has changed between years. The ability to download the Credibility report to Excel. The tables can be downloaded individually or as a whole through the report itself. 27 28 October 2016 This release includes the sign-off functionality. Once all queries and issues are resolved, providers will be able to sign-off their data to complete the submission process. 26 14 October 2016 This release includes the Data Supply report. This report gives you a copy of your data back but also includes all the derivations that we apply to the data so that you can recreate the Credibility tables and produce your own management information reports. Data supply includes both Excel and XML files so that you can either import directly into your system or utilise the reports locally to create pivot tables and charts. All Credibility reporting tables are now available for use in quality assurance. With the release of these reports we have also enabled the 'commit' button for providers that have successfully uploaded a file that passes schema, business, exception and continuity stage rules. The commit action notifies HESA that you are ready for ourselves and HEFCE to start quality checking your submission. Providers are required to process a commit transaction by 24 October. If you have any questions about the commit process or the data collection schedule please contact the Liaison team. A number of fixes to known issues have also been released and they are detailed in the Known issues page. An update has also been made to the HEFCE designation file that is used in validation. Future releases will address a number of bugs that are currently listed in the Known Issues page. This is the first release of the Credibility report which contains management information tables used for quality assurance. There are more tables to come in future releases and you are encouraged to review these tables to ensure that they reflect the profile of your organisation. The changes to these rules are largely behind the scenes and represent an update to how we determine designation status. This release includes the new exception stage rule QR.C15054.InstancePeriod.HEAPESPOP.12. In addition there has been some 'behind the scenes' work on the validation kit to enable us to release a greater proportion of rules through the validation kit rather than being available only on the data collection system. New rules will start to be released in the coming weeks. An update to the designated course list that is used in validation. This means that providers who were previously failing validation either on the validation kit or through the data collection system for courses that have designation should now pass validation. A number of exception rules have been updated in the Quality rules page on the coding manual. Although these rules are not available in the data collection system yet, this means that you are able to have advanced sight of the rules that will be coming shortly. The 'AP student Admin' role can now be requested in the Identity System. This role allows the user to grant the Submitter, Guest and Query roles to other colleagues within the organisation. Fixes for issues 15068 and 15048. An update to the Entry Profile report to enable providers to continue processing and access other reports where Entry Profile errors exist. This should allow providers more flexibility to prioritise their work. Once a schema valid file is uploaded the DLHE population report will be generated. This report provides a list of the students eligible for inclusion in the 2015/16 Destination of Leavers from Higher Education survey. More information on the DLHE survey can be found here. This report highlights any records that have been submitted without Entry Profile data. For those providers who submitted data in 2014/15 a check will be made to ensure that all continuing students have Entry Profile data from the previous year. The first release of the data collection system, including the quality rules currently available in the downloadable validation kit and the Frequency counts report. The XML data entry tool for the 2015/16 return is also included in this release.